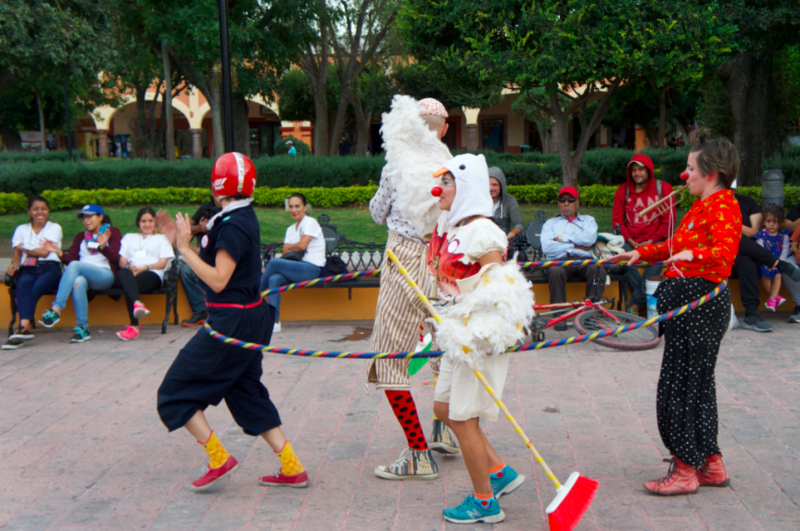 Clowns Without Borders is planning a tour to the US/Mexico border. Molly Rose Levine created a document for those considering arts/children’s/cultural interventions to support the children and families currently seeking asylum at the US/Mexico border, specifically in Tijuana. Molly Rose compiled this information through conversations with grassroots partners and those working with asylum seekers in the region. We share it here with the hope that all arts-organizers can be respectful, safe, and effective. In November, 2018, nearly 8,000 people arrived in Tijuana, Mexico. There are between seven and eight thousand people sheltering in the city, and so far 6,000 are in line to submit for asylum. Asylum seekers have been moved to two new shelters more than ten miles away from the border. Though these camps are run by Mexico’s federal government, they’re operated by NGO committees, which remain largely responsible for providing services. The flow of people is still increasing, and expected to increase for some time. Asylum seekers and migrants who do not choose to self-deport, once registered for asylum, are expected to remain in Tijuana for six months to a year as they wait to process their applications and receive court dates. During the time that a person is in the process of seeking asylum in the US, they’re not allowed to obtain a work permit in Mexico. As more caravans arrive at the border, challenges to human services, waste management, and infrastructure will probably continue to be met by humanitarian aid services, mutual aid organization, grassroots networks, and volunteers. Listen to your local partners: This is the most important guideline. As an outside group, your job is to be reactive to the needs of your grassroots partners and stakeholder community. They are the experts in their situation and their needs. You are here to support them. Listen authentically and humbly. Be prepared to react to new and emerging situations. Understand that you might think that you have a “better” idea, but if the people most affected by the disaster don’t want it, then it’s not the right idea. Leave your ego at home. 1-to-1 Spanish speaker ratio: If your team includes a non-spanish speaker, make sure that each non-spanish speaker has a spanish speaking counterpart. This is to ease communication with the community members, ongoing service providers and organizers and to make sure that everyone clearly understands safety protocols. No photos/ No videos: There is already a large presence of media and journalists. Only US & Mexican citizens: There is a precedent that volunteers coming into the area on a visa are at risk of being arrested and having their visa revoked/being deported. Keep your team safe and make sure to only bring citizens at this time. Do not promote your programming until it is OVER: This one may be counterintuitive as you look to crowdfund your idea. There is tension between the host communities and asylum seekers, and as “cultural” programming and psycho-social support, some members of the host community can see your promotion as “advertising” which is “encouraging” the continued flow of people to the border. This can and has created a backlash and increased stigma against the asylum seekers. For this reason, you should not promote your project on social media (you aren’t supposed to photograph anyone anyway) until the programming is over, or unless you are doing something in very deep collaboration with a local partner who is advising your media presence. Once you’re back home? Use your writing skills to advocate for whatever your take-away was from the project. Let your experience educate others. No political actions: Different people have different jobs in a crisis area. Some people are going to the border to march and to support a political agenda, which is their right. If you are going to provide services for people who have experienced trauma, your political agenda is more likely to create a backlash against them, than it is against you. If you are working with an artistic intervention, or representing child friendly programming, do not participate in marches in your free time. This can create a backlash with the host community, with your local partners, and ultimately harm those you are intending to support. Take crisis-informed safety precautions: Borders are generally a place where you should take safety precautions, and crisis only increases that reality. There are instances of violence, drug trafficking, and other illegal activities happening around the border, putting asylum seekers, the host community, and service providers at risk. Follow the same safety protocols that are good practice in a refugee camp or in a conflict zone. This is a humanitarian crisis, and all volunteers should be aware of safety norms. Talk about your safety protocols as a group before you arrive. Stay with your local contact/fixer/handler, travel as a group, do not walk alone at night, and be aware of your surroundings. Do not drink to excess, or use illegal drugs. Respect the cultural norms of the communities where you stay. Make sure someone outside of your group has a copy of your itinerary and the ways to be in touch with you, in case of an emergency. Listen to your local partners and leave the hubris at home. Do not try to be a hero. The situation is changing rapidly. CWB will continue to update this information as we receive it. You may find the original content here. Next Post: How much does a tour cost? I was in Tijuana performing in December. I’m happy to talk with anyone going or thinking of going.